Our 100% online Silica Awareness for Construction course provides awareness training for workers who may be exposed to silica hazards in the workplace. Students will learn about respirable crystalline silica, silica hazards, compliance with OSHA’s respirable crystalline silica standard, silica exposure prevention, and more. This course may be be taken as Initial or Refresher training. Silica exposure can occur while performing construction activities and while using common construction equipment. 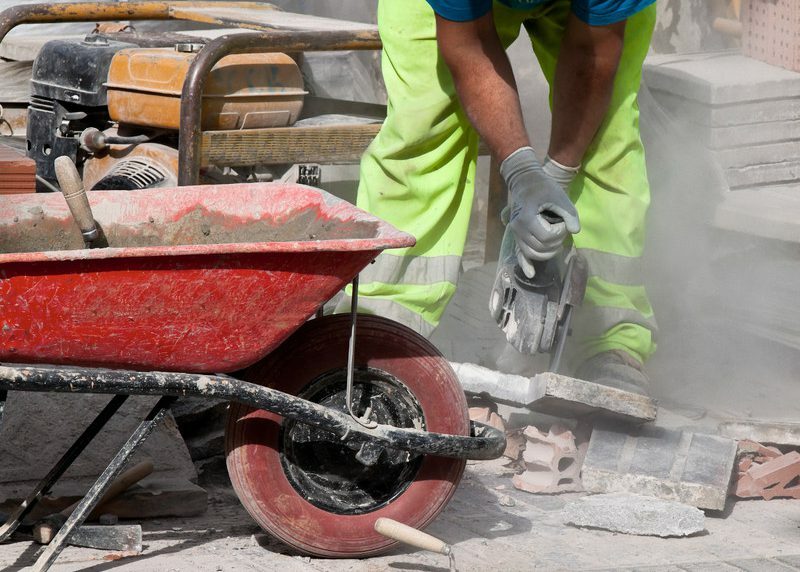 Respirable crystalline silica exposure can cause serious adverse health effects, such as lung cancer, silicosis, and respiratory disease. For more information on OSHA Safety training requirements or the Safety training courses we offer, visit our OSHA Safety Training page. This Silica Awareness training is provided 100% online as a fully narrated course. The training is self-paced and available 24/7 through our state-of-the-art Online Training System (OTS). The course features interactive elements and both audio and visual elements for maximum retention. For your convenience, it can be completed over time, and your progress will be saved to the last section completed. Students are given 6 months to complete the course after enrollment. We are so certain you will be satisfied with your experience, that we offer a 100% Money Back Guarantee*. Silicosis overview | The 2016 OSHA Rule | Silica training for construction | OSHA Standard exceptions | Key terms | Objectives | Silica training requirements. What is silica? | Forms of silica | What is crystalline silica? | What is respirable crystalline silica? | Silica dust exposure | Cutting and drilling operations | Demolition | Silica exposure hazards | Silicosis | Symptoms and illnesses | Prevention. Respirable crystalline silica standard compliance | Exposure control methods | Requirements | Permissible exposure limit (PEL) | Limiting silica dust exposure | Engaged employee | Fully and properly implemented | Equipment instructions | Water delivery systems | Dust collection systems | Automatic filter cleaning | Indoors or enclosed areas | Task duration | Respiratory protection requirements | Housekeeping | Written exposure control plan | Medical surveillance | Hazard communication | Recordkeeping. Remaining requirements | Required training and compliance | Competent person training. 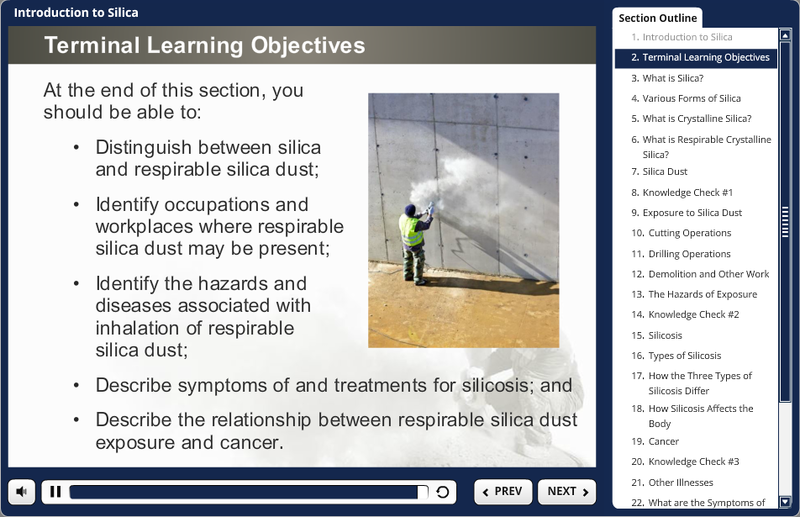 The objective of this Online Silica training is to provide general awareness of OSHA regulations, requirements, risks, and prevention methods for employees who may be exposed to silica in the workplace. Understand silica dust avoidance methods, such as PPE, engineering controls, and workplace practices. 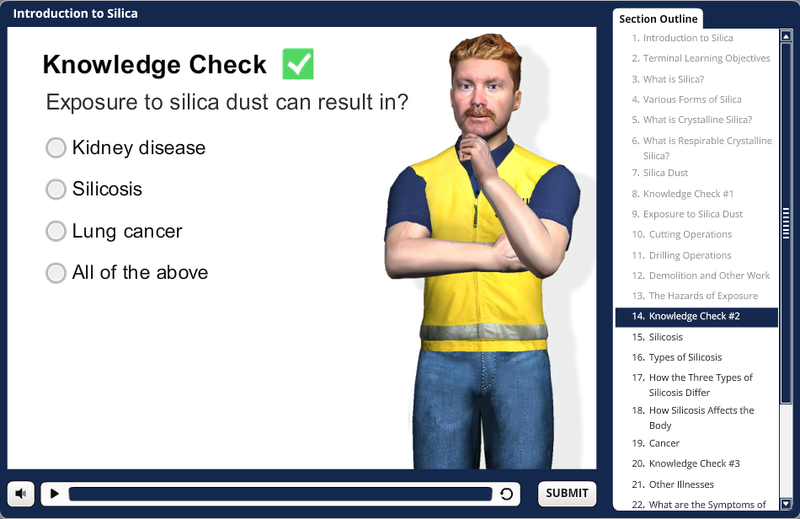 This online Silica Awareness training consists of 4 sections, featuring full narration and interactive quizzes to help students retain the material. The final exam for this course consists of 10 questions compiled from a large pool of possible questions. A 70% or better score is needed to pass the final exam. Students may re-review the training material and retake the test as many times as needed in order to pass. This Silica training course was designed by Certified Outreach Trainers. Once the course is completed, you will immediately be able to download, save or print your Certificate of Course Completion which is provided in PDF format within our Online Training System (OTS). We also offer the option to be mailed a PVC credit card style Wallet ID Card with optional photo, showing training course completion. If selected during enrollment, this ID Card option costs an additional $5.00, and the card will be mailed within 24 hours of course completion. Please note that this course provides valuable Silica Awareness information which applies to the general population of workers who may be exposed to hazardous silica on the job. This course is not meant to replace company-specific training provided by your employer on equipment use and procedures for your particular work environment. Employers must ensure you are trained using the specific protective equipment you will use on site prior to commencing work. You must be trained by your employer on the hazards, equipment, engineering and administrative controls, safe work practices and emergency plans specific to your role and workplace.